Roseau, Dominica – April 23, 2009………………Parliamentary Representative for the Castle Bruce constituency and Minister for Community Development, Culture, Gender Affairs and Information, Hon. Loreen Bannis-Roberts has described the handing over of a new bus to the school children of her constituency as “historic”. The ceremony which took place in Petite Soufriere recently, was attended by hundreds of people from various parts of the Castle Bruce constituency. Mrs Roberts recalled the many miles children have to walk in poor weather conditions to and from school. Hon. Bannis-Roberts, who has represented Castle Bruce in Parliament since the year 2000, said it was the first time that the Castle Bruce constituency was getting this level of attention from any government. Mention was made of a number of projects that have been implemented over the last several years in the Castle Bruce constituency by the Labour Party Government. These include: the start of construction of the $3.2 million San Sauveur Primary School; repairs to the school in Petite Soufriere; the construction of the Shaw Shaw to Fond Bleu road; rehabilitation of the Good Hope- Castle Bruce road; the Petite Soufriere road; the Good Hope main road; the Ma Prince Road, the Haute-Fye Road among others. In addition, according to the Minister, the community of Savanne has got pipe borne water for the first time. Fishermen from San Sauveur have benefitted from the construction of a breakwater system as well as locker rooms. The Minister added that Government also contributed to the construction of the resource centre in Good Hope. “I will continue to give you effective representation. I will continue to make your concerns known to the various authorities and ministers concerned because I care about the well-being of my constituents,” Hon. Loreen Bannis-Roberts concluded. Addresses at the handing over ceremony also came from Prime Minister, Hon. Roosevelt Skerrit and the then Acting Minister for Education, Hon. Ian Pinard. The cost of the school bus is $173,000. Government will pay for a driver and a conductor as well as the insurance and operating expenses of the vehicle. 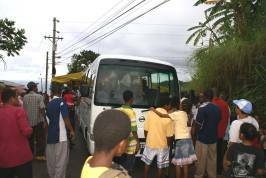 The provision of the school bus to the children of San Sauveur, Good Hope and Petite Soufriere is part of a wider programme by the Government of Dominica to provide school buses free of cost to eight hundred and eleven (811) students from primary and secondary schools in nineteen villages across the country. Ten buses have already been secured for the programme.